EAST BRUNSWICK, N.J., Feb. 15, 2018 /PRNewswire/ -- Picky pizza lovers in East Brunswick are in luck! Pie Five Pizza Co. – the fast-casual restaurant known for its customizable pizzas prepared and ready to enjoy in five minutes or less – is opening its first East Brunswick restaurant on Monday, Feb. 19, at 603 NJ-18 in Summerhill Square. To celebrate its grand opening, Pie Five will have an official ribbon-cutting ceremony hosted by Mayor Brad Cohen of the Township of East Brunswick on Wednesday, Feb. 21. This marks the second Pie Five in New Jersey. "We are excited to expand and bring our exceptional pizza experience to East Brunswick," said Pie Five Franchisee Dinesh Goswami. 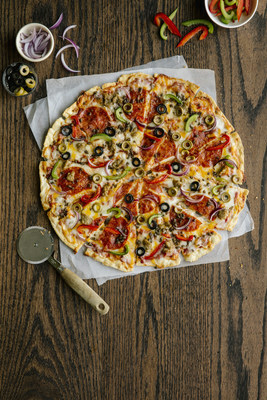 "Our comfortable, clean and friendly environment combined with speedy service and quality ingredients makes Pie Five the go-to spot for every pizza lover. We've assembled an awesome team and we're all looking forward to becoming an integral part of the local community."